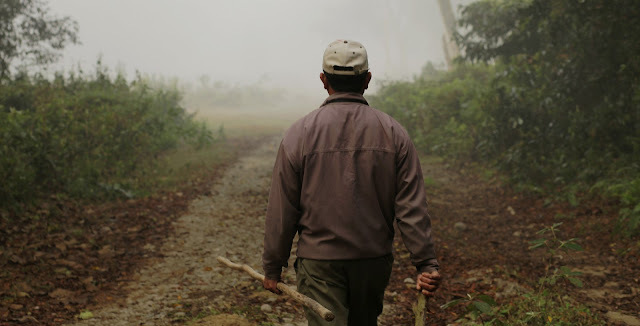 Our guide, Brama, armed only with a couple of sticks. 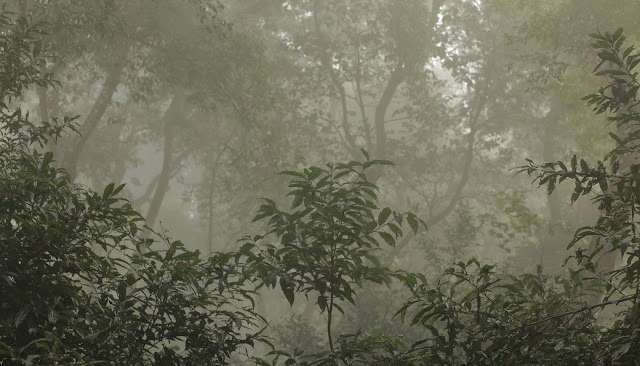 Walking in the jungle in the early morning with heavy fog gives it a fun, eerie feel. Spotted deer through the morning mist. First rhino sighting. We were on foot. She was sleeping. So we decided not to disturb her. I'm no arachnologist but I think this is a St. Andrews Cross. Matt taking a close-up of our second rhino sighting. We set out into the misty early morning to go on our first jungle encounter (1/4 attempts to see rhinos, crocodiles, elephants, sloth bears and the elusive jungle cats). We got a brief lesson on surviving a rhino charge (hide, preferably behind a big tree - I guess our guide didn't trust our zigzag running skills). It was nice to meander through the forest paths with someone who had grown up on the edge of the park, but also had some good naturalist knowledge as well. It felt counter-intuitive to slink (almost) silently through the jungle, so we could startle and upset wild animals. I also am amazed at how naturalists can walk in the jungle looking for animals while not tripping on roots, it's kind of either or for me (although by day two I had improved and was feeling kind of Jane Godall-ey). We lucked out and had two rhino spottings that morning, plus crocs, rhesus monkeys, barking deer, spotted deer, sambar deer and lots of birds. 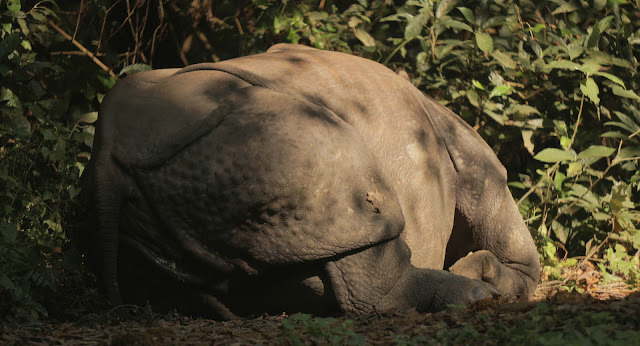 Both rhinos where sleeping when we found them (or maybe it was one, sleeping in two spots?) the rhinos are not bothered by the people on elephants, but don't like people on foot. One of them stood up with enough intention to make our guide have us jump up behind some trees. Once she was satisfied we were put on notice, she settled into breakfast.